but i have a strong will , know how and the time to make this heap of junk into i shiny new GFR. Where to start ? Let`s see , at the beginning . 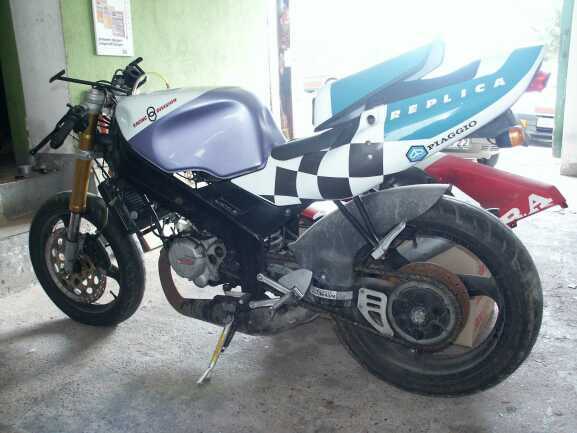 you can see on this picture that i don`t have the ignition cover nor the chain cover. After pulling down the head and cylinder i found something very disturbing. Then i started working on the frame and disassembly the rest of it. Iv`e noticed some rust here and there and wanted to sort i out , i simply hate the rust issues . These are some of the larger parts that iv`e could not pack in a box. Rear swing arm stripped from paint , cleaned , waiting for the rest of the frame to be stripped from paint and cleaned for painting. Stripping and cleaning the frame , removing the paint and rust from it. As all of you know the battery acid spills are a nasty thing. So much rust from it. The glass was missing so i made a new one and this is how it looks. This is it for now , i`ll be posting some more photos when i paint the swing arm and frame. But the price was ok.
On the other hand... looks like you have some experience with rusty vehicles. What looks a bit strange to me is the piston. That's *not* the original GFR piston. Can yo have a look to the inside. The bottom is marked with an arrow, CX and the mentioned letter for the diameter. On this topic , there are no markings on the piston , so i guess it`s not an original. Anyone has an photo of the original piston ? I`m willing to trade my front wheel for an original one. Anyhow iv`e primed the rear swing arm for painting , pictures maybe later or tomorrow . CokiGFR125 wrote: I`m willing to trade my front wheel for an original one. That's what a quick search for the piston found on my harddisc. Next weekend you can have some more pics. They still sell them. But quality might not be very god. I have heared very different statements about this. So risc was to high for me. Always nice to follow a big "restauration". Hope you can find all the missing pieces. I'm sure that Marco (forummember) can help you a lot too. Gottfried is selling new and used parts. and it would be odd because this is serbia and the bike has 27000 km on it. At some point of it`s life it had to die. Anyhow i`ll try to contact Marco for the piston issue , i mean getting a new one. piston to him and he will bring it over to me. I don`t understand almost nothing , but thank you for the info it`s helpful in every way possible. When i finish that i will start working on the fuel tank and rest of the body. What i could offer is the GOL piston. I will take some pics when i'm at home nex t weekend. Maybe you could also buy this one at a local shop. Marco also has said something about a source for pistons in italy. Iv`e primed the frame , this sunday will be painted. I`ll try to contact Bob Wright in GB , also i don`t need the pics of your piston , just send me an PM with the price tag , also i will send Marco the same question about the piston , and hopefully he will join this topic. In the next few days i will start working on the fuel tank and other pieces of the body , i have a lot of work on that field . BTW did you have a look at your engine number? It's recomended for the CX, but the ASSO number is the same. I have long time Serbian friend here in Nigeria with an Aprilia Millie. Keep the pictures of the rebuild coming we are all waiting to see the end result.